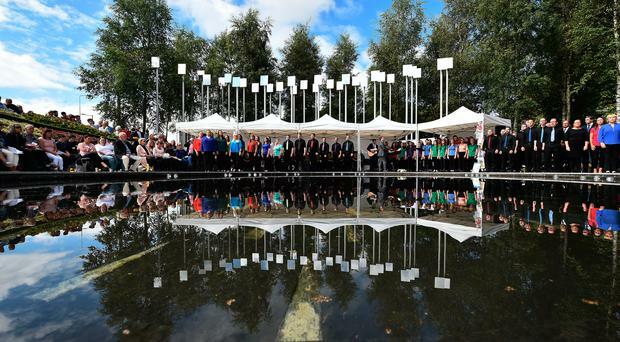 The cross-community service in Omagh yesterday to mark the 20th anniversary of the appalling terrorist bombing in August 1998 underlined yet again the horror of violence, and the enormous continuing suffering. The Real IRA blast was the single worst outrage of the Troubles. It killed 29 people and unborn twins, and left many more injured. How pitiful it was to witness the families in Omagh gathering together yesterday to remember their dead. Two decades have passed since the bombing, but in recent days the horror of Omagh has returned to the public consciousness through the shared painful remembrances of those who lost relatives, those who survived, and those who offered help in the aftermath. The Omagh experience is an example of how the Troubles here are remembered. The multiple victims of major atrocities are brought to mind as the various anniversaries come round, but perhaps not so directly the thousands who died in ones or twos in many of the other dreadful incidents. However, these people are most vividly remembered by their families and friends who have cause to think about them not just on the anniversaries, but every day because they are still haunted by their trauma, grief, anguish and sense of injustice. Most shockingly, as we reveal today, around a third of the people directly affected by the Troubles have attempted to take their own lives. There are also many people waiting for compensation, including those affected by Omagh. The difficulty of addressing fully the violence of the past is illustrated by the strong reaction of many people to the proposals issued by the Victims' Commissioner - currently out for consultation - with some relatives believing that they have little chance of getting justice. It is impossible to ignore such continued suffering so long after each atrocity occurred, and two decades after the Good Friday Agreement. It is disappointing, indeed appalling, that we have not yet been able to assuage the sorrow and suffering of these people, with their still raw and painful emotions and their sense of injustice. The drawn and stricken faces of the survivors and families of those killed and injured in Omagh in 1998 show the stark reality of grief felt by all victims and their loved ones which, tragically, will not go away.